AMBUCS Park spans 22 acres. 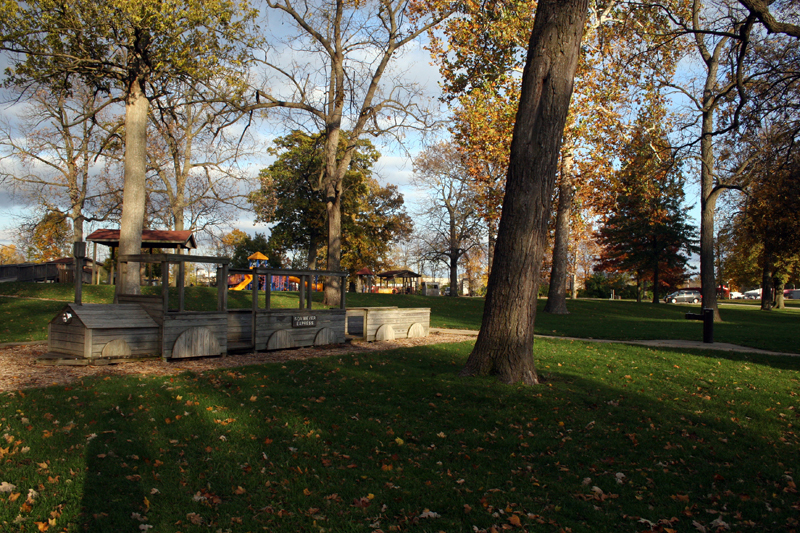 AMBUCS Park, originally known as Woodland Park, has undergone a significant metamorphosis-adding many active park features to the wooded site since it has come under the management of the Urbana Park District. However, its history of recreational activity dates back decades before the park district's involvement. Once referred to as Webber Woods by neighbors before involvement by the park district, it had both an open grassy area and a beautiful wooded section that longtime neighbors recall being much denser than today's AMBUCS Park. The Green Meadows Girl Scout Council signed a lease on August 8, 1930, to use the area for scouting programs. Their summer camp activities took place there for thirty years. About the same time, another group was also in need of a home for its activities and eventually settled into one of the buildings on the land. The Girls' Hobby Club, as it was known, was organized in 1937. Leaders and eleven girls began meeting at the Salvation Army Church and in sponsors' homes to do everything from cooking and sewing to handicrafts. They also covered dramatics, learned about manners and took field trips. ln 1940, the Urbana-Champaign Sanitary District offered space in one of its storage buildings in the park to the club sponsors. Fathers of girls in the group remodeled the building, adding heat and plumbing. The club held annual fundraising activities, including an annual rummage sale and "Coffee Carousels" held at sponsors' homes. The club grew to include activities for younger girls. In 1951, a program for boys was added and the name was changed to the Girls' and Boys' Hobby Club of Northeast Urbana. By the late 1950s, the club recruited recreation majors from the University of Illinois to help lead activities, and the sponsors acted more as directors and fundraisers and less as leaders involved in daily activities. The club continued to provide organized activities for neighborhood youth until 1968, when interest began to wane. The club disbanded and donated its assets to several organizations around town, including the Urbana Park District. By this time, the park district already had leased the park property from the Urbana-Champaign Sanitary District. Board President Walter Keith accepted a donation of $2,500 from Portia Cureton and Melba Reichard, then leaders of the Girls' and Boys' Hobby Club of Northeast Urbana. The funds were to be used toward construction of a ball field in Woodland Park and a suggested "Carousel Traveling Theater" to be built by district staff and used for district recreation and cultural activities. This traveling stage was used for many years. After the scouts opted to leave and ended their lease, the Urbana Park District signed a 99 year lease with the sanitary district in 1960 for the 22-acre site. The park district wanted the site because of perceptions that its existing parks were becoming too crowded-more park acreage was needed. The Green Meadows Girl Scout Council donated its buildings to the park district. The Urbana Park District continued to use the buildings for its own organized summer activities. Neighborhood children were served by this park program, which included basketball, crafts and more. "It kept us out of trouble;' said participant John Boley, now a longtime park district employee. A new entrance was created and interior roadways were redesigned. The former clubhouse needed rehabilitation. Residents asked for picnic tables, tennis courts, and playground facilities. A 1984 master plan envisioned the park being used primarily for picnicking, bird watching and walking. 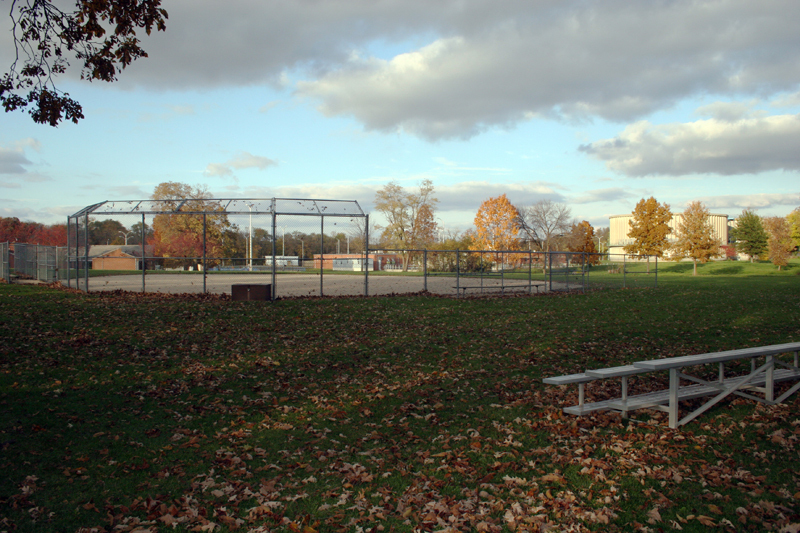 That plan, prepared by Brown, Hemp and Associates of Champaign, also included a lighted softball field for those seeking more active recreation. The 1984 plan began to change in the 1990s. 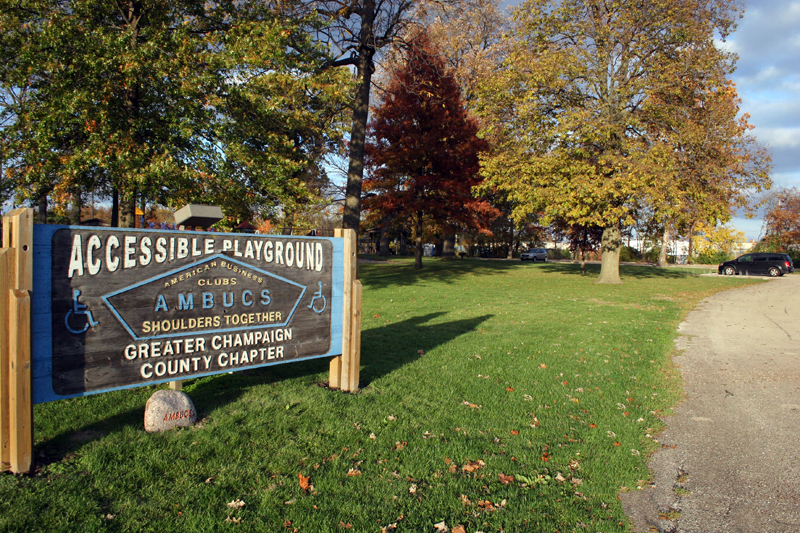 That's when determined volunteers from the Greater Champaign County Chapter of the American Business Clubs (AMBUCS) said they wanted to help the Urbana Park District create a playground that would be fully accessible to children with special needs. AMBUCS club member Ron Meyer was visiting Florida in the early 1990s when he saw a playground for kids with disabilities. Meyer decided that his hometown should have a similar facility. He convinced the AMBUCS to take on the challenge. The AMBUCS offered to create a playground similar to the one in Florida. Urbana Park District officials were a bit skeptical, Meyer and fellow AMBUCS charter member Keith Jamieson recalled in late 2006. "They [park district officials] were concerned we'd start a project and then leave it for the park district to finish:' Meyer said. The modular accessible playground carried a price tag of nearly $12,000, a big project for a club with twenty-two members. Urbana Park District staff realized the potential limitations of the club but became convinced to take on the project. The Planning and Operations staff teamed with the dub to create the district's most unique playground of that era. The result: the 1992 installation of an accessible modular blue, red and yellow play structure purchased by the AMBUCS. Park district staff and AMBUCS members worked side-by-side to construct the play structure. Members also installed sidewalks to provide access to the structure and to several stand-alone themed play pieces, that were added to the project over several phases. Illinois Power provided temporary power and other equipment to bring electricity to the site with company workers donating their time. The playground was officially opened and dedicated in 1993. Since then, AMBUCS members have helped the park district add new features to the park. A shelter named for Jean Driscoll, eight-time winner of the women's wheelchair division of the Boston Marathon, was dedicated in 1997, the year after Driscoll won her seventh consecutive Boston Marathon. A smaller adjacent pavilion bears the name of the late Nick Santi, whom Meyer said was an AMBUCS member who helped in the initial stages of the playground development. In 1999, a $20,000 donation from AMBUCS helped pay for expanding and rehabilitating restrooms to make them fully accessible. In 2000, the district began preparing a new master plan for AMBUCS Park. Changing demographics, revitalized recreation programming and increased neighborhood interest in the park required a fresh look at the park's potential uses. 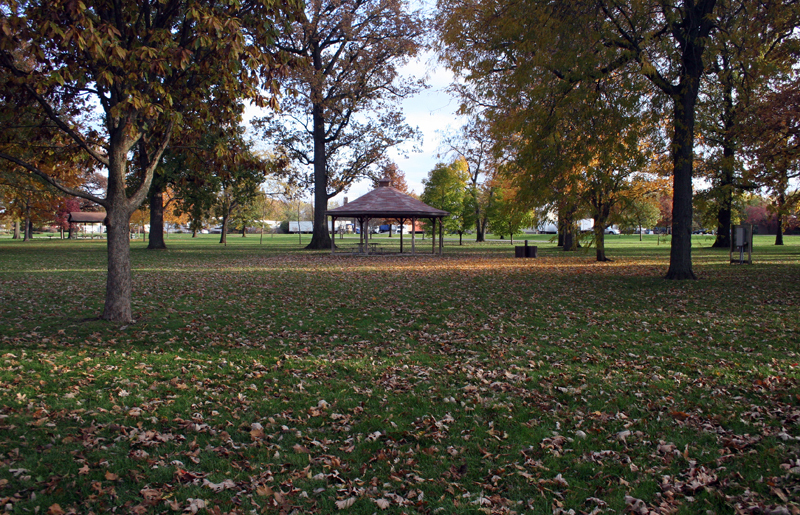 A subcommittee of the Urbana Park District Advisory Committee (UPDAC) spent approximately two years analyzing the park surroundings, examining the condition of park features and vegetation, and considering additional features for the park to make sure it would be attractive to future generations. The new master plan calls for a neighborhood entrance on the west side of the park, a comprehensive bicycle/pedestrian trail system, an additional softball field, a sand volleyball court, improved landscape and flowerbed displays, a naturalized drainage swale with bridge crossings and improved parking facilities. 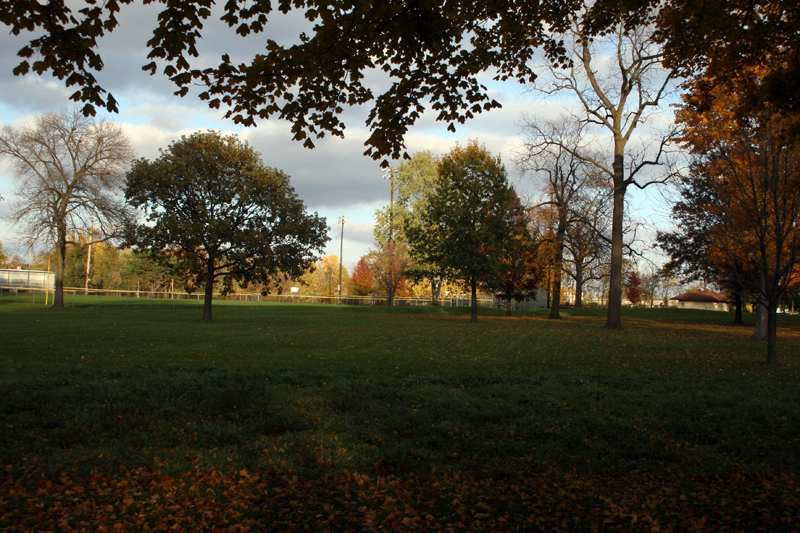 The Urbana park board approved the new master plan in 2001. The park's softball field is home to the Challenger League, a Kiwanis-sponsored baseball program for physically challenged youngsters that began in 1999. According to program founder Tom Jones, "AMBUCS Park's trees provide shade where players can cool off on hot days, and substantial shade areas were missing at other parks the program considered." playground would replace older equipment in that area. The AMBUCS chapter has received the Urbana Park District's Community Service Award, and what was known as Woodland Park for more than three decades has been renamed AMBUCS Park. But club members will tell you the most satisfaction they receive is when they see youngsters enjoying the playground. Today, the Americans with Disabilities Act specifies that all newly-constructed playgrounds include accessible features. Playground industry regulations and standards adopted by park and recreation agencies since the Americans with Disabilities Act of 1991 have also changed. Future playground redevelopment can no longer include handmade pieces like those AMBUCS created in the 1990s. However, there will always be room for the kind of dedication found in groups like AMBUCS and the Kiwanis Challenger League volunteers. 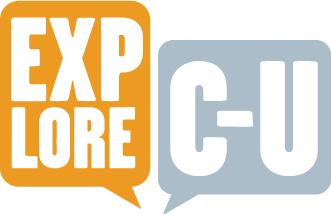 Urbana Park District , “AMBUCS Park,” ExploreCU, accessed April 21, 2019, https://explorecu.org/items/show/119.